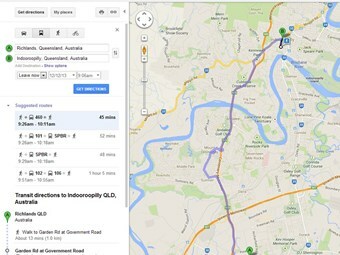 South east Queensland’s entire public transport network is now available through Google transit. Google Transit is an easy-to-use public transport journey planner which acts as an alternative to TransLink’s current journey planner. Transport and Main Roads Minister Scott Emerson says Google Transit provides another avenue for passengers to plan their journeys, across one of the largest networks in the world. "Tourists and visitors to south east Queensland will find this a useful tool, and it continues our promise to reinvigorate tourism which is part of Queensland’s four pillar economy," he says. "It works by combining TransLink’s network data with Google Maps, integrating transit stops, public transport routes, schedules and fare information." "The beauty of using Google Maps as a platform for journey planning is that the interface is familiar to people from all corners of the globe." Product Manager for Google Maps, Australia and New Zealand Nabil Nahgdy says Google Transit is also available on Google Maps for Androids and iPhones. "Simply search for where you want to go and Google Maps will show you how to get there using public transport from your current location," Nahgdy says. Emerson thanks Google for partnering with the Queensland Government to make Google Transit a reality for hundreds of thousands of passengers who use the network daily.